between Perry St and W 11th St.
Tuesdays – Saturdays, 7:00 p.m.; Saturdays and Sundays, 3:00 p.m.
“In Cowboy v. Samurai, Michael Golamco’s freshly acute (and hilarious) reinvention of the classic Cyrano de Bergerac story, characters negotiate the sketchy terrain of romantic attraction as they wrestle with expectations, reservations, pride, and prejudice. 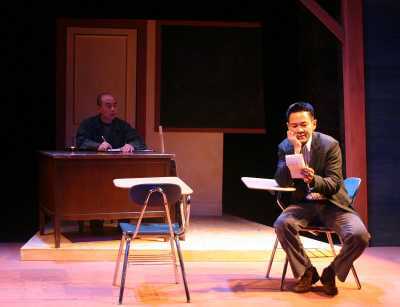 The National Asian American Theater Company has produced a superb incarnation of Golamco’s script. ‘Race has nothing to do with being attracted to someone,’ says Travis, the protagonist of Michael Golamco’s Cowboy v. Samurai. But in this witty, satiric comedy, that statement is challenged over and over again as the playwright updates and adapts Edmond Rostand’s Cyrano de Bergerac, substituting race for an oversized nose as the central issue. While all of the play’s major plot points are based on Cyrano, Golamco’s focus is on contemporary race relations. 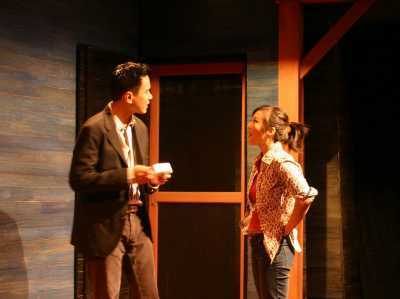 Racial humor is prevalent in the play as Golamco satirizes militant views on racial purity and skewers stereotypes that inform the ways in which Asian Americans are perceived. Cowboy v. Samurai also addresses more complex issues of self-identification and self-hatred. Similar to Cyrano’s famous speech in which he insults himself in a far more grand manner than anyone else is capable of, this scene drives home the fact that such negative perceptions have become internalized. De la Fuente is terrific as Travis, at once confident and insecure. Lee is a hoot as Chester, making the character’s increasingly wacky attempts to find his identity endearing and, in an odd way, believable. Davis has an easy charm and swagger appropriate to his character; the role as written could easily become flat or stereotypical, but the actor plays it with a goofy amiability. 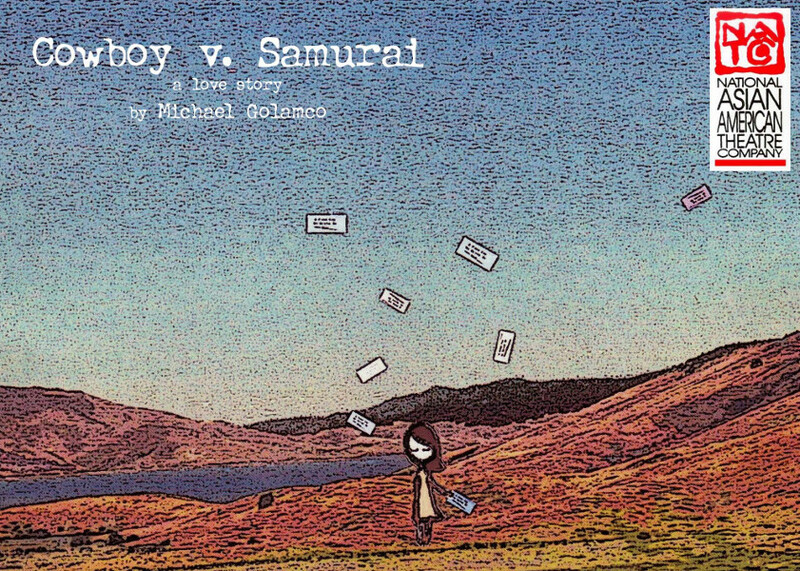 Cowboy v. Samurai is a contemporary retelling of Cyrano de Bergerac set in the mythic American West. When a beautiful Asian American woman moves to Breakneck, Wyoming, everyone’s in love – the samurai who doesn’t know who he is, the cowboy with the chew and blue jeans, and especially our Cyrano, an Asian American hero who doesn’t stand a chance. 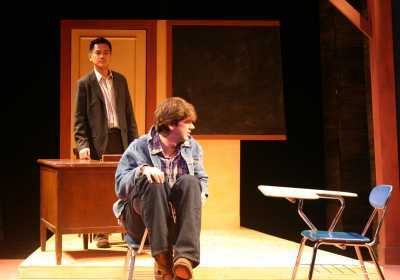 In this lyric romantic comedy from one of Asian America’s most exciting young playwrights, love letters are sealed and bound, horses set ablaze and the history of railroads deconstructed. Cowboy v. Samurai makes the problems of race as plain as the nose on your face.